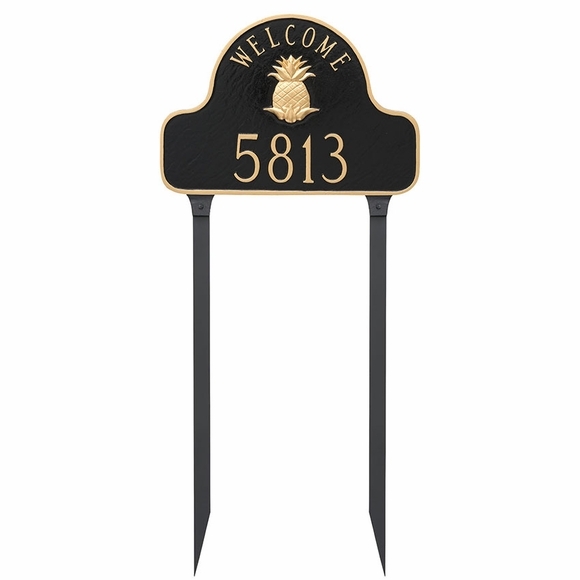 Address Sign for House - - personalized lawn mount pineapple welcome sign with address. Made in the USA. Decorative arch plaque with a pineapple picture and the word "WELCOME" in the curve of the arch. Single-line address sign holds up to seventeen (17) 1.25" characters (including spaces). Twenty-six different color schemes: antique copper copper, aged bronze gold, black copper, black gold, brick red gold, brick red silver, black silver, black white, chocolate gold, chocolate silver, gray silver, gray white, hunter green gold, hunter green silver, navy gold, navy silver, sky blue gold, sky blue silver, sand gold, swedish iron black, swedish iron silver, sand silver, taupe white, white black, white gold, and white silver.